A chew toy makes Cleveland a happy dog. An alpha cat pretty much ruled the roost at the Sinker house, but Linda and Joel wanted a dog. They knew it would take a special sort of pup, so they began browsing on Petfinder and even went to home visits, but not one of them seemed as if he or she would fit in. And that’s important for peace and harmony in the house. 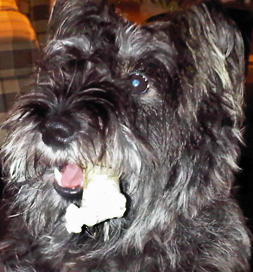 For the Sinkers, who live in Georgetown, ON, the ah-ha moment came when they spotted a Schnauzer/Terrier mix described as calm on Petfinder by the Monroe County Dog Pound in Cleveland, OH. His ears had been surgically altered so they were half the width they should have been, meaning he looked a little strange, but that didn’t bother them. “He was 10 months old when we met him,” says Linda. “He let us pick him up and cradle him and basically do anything to him without a fuss.” He’d obviously been neglected before he came into shelter care because he didn’t know how to play. Within weeks in his new home, he had learned to play fetch as well as walk on a leash. They named him Cleveland, after the city where they adopted him. “It took awhile for our cat to accept him,” Sinker says, ‘but now they are best friends.” The alpha has been won over by the sweet Cleveland. He’s a fastidious boy who won’t potty in his own back yard, which keeps the premises nice and tidy, but means taking him on walks three or four times a day. Good for his and his family’s health, but not so much fun when there’s a polar vortex. Still it’s little bother for such a devoted pet. “He is extremely lovable and will sit by your side for hours, especially when you’re sick. It’s as if he is looking after you in his own way,” Linda says. The little dog has become a very special family member.